For forty years, customers have trusted Spenco to provide them with the best in orthotics, shoe insoles, heel pads and arch supports. They know that our products are endorsed by the American Podiatric Medical Association and the Federation of International Podiatrists. 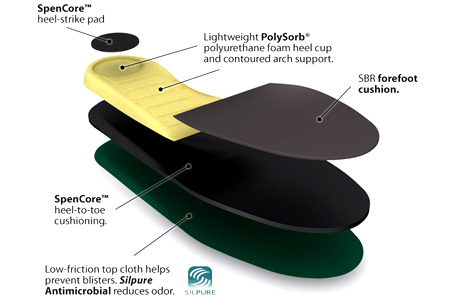 Spenco PolySorb® Total Support Sandals continue the tradition of quality our customers have come to expect. Often, flat, slab-style sandals don’t include arch or heel support and offer no protection against pronation or supination. The Spenco PolySorb® Total Support Sandal is still a simple, slip-on sandal, but it’s designed with an intelligent, thoughtful approach towards proper foot support. 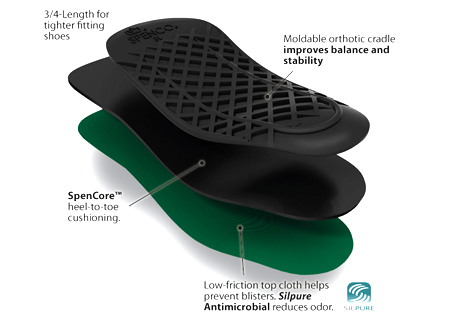 Spenco has built the quality of heel and arch support found in orthotics into these sandals while guarding against pronation and supination with motion control and impact cushioning.